First of all, I would like to apologise that I've made some mistake on my previous post on the soft bun sandwiches and cheesy bread strips. I simply forgot to include the 45 grams of unsalted butter at the recipes. Please accept my apology. My hands feel very itchy when I'm away from home as I miss touching on those utensils and ingredients. Without any recipe books with me and my mind was running out of idea, I try to find out some interesting recipes from others blogger. First, I tried this Honey Buns recipe from HHB which the result came out really soft and fluffy. I must say, using her recipe will never fail. I was inspired by MH that had just tried out this recipe recently. It remind me I need to try out this recipe when the last time read HHB's blog. 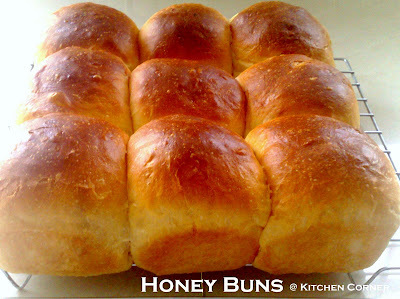 My family like this honey bun very much as it's really soft and the smell of honey taste really good. I've no chances to took more pictures as it's finished in no time. Here is another recipe that I tried from Piggy's Cooking Journal. I must say it's really yummy as I like its smell and crunchiness! The smell of the rosemary is fantastic with the walnut gives extra crunch of texture. All thanks to all the great blogger sharing the excellent recipes!